Joseph Kamaru Macharia, the iconic Gikuyu benga musician, was yesterday laid to rest at his home in Heho village, Murang’a County. Kamaru exited the stage in the same dramatic style he had lived his life, surrounded by adoring fans who danced and hummed to his compositions in what appeared to be a carnivore rather than a funeral. Gikuyu’s most accomplished artistes were at hand to pay their last respects to a man who since the mid-1960s nurtured talent. The political class too and top Government officials were in attendance. President Uhuru Kenyatta was also there to bid farewell to the musician who performed during his wedding in 1989, a man he said he had admired since he was a small boy. Deputy William Ruto, Opposition leader Raila Odinga and other politicians patiently waited as Kamaru took his final bow. Atop Kamaru’s casket rested a maroon Stetson and a banquet of roses. Fourteen guitars leaned on their master’s coffin, a poignant reminder that the maestro will never again strum them and send the hearts of his listeners throbbing and his fans crying for more. Kamaru, dubbed the “King of Gikuyu pop”, died on October 3 aged 79. He is survived by a widow, five children and a number of grandchildren. His cortege was met in Murang’a by a throng of mourners who had waited hours to pay their last respects to the man who had lightened up their lives with his music. The service was punctuated by short renditions of Kamaru’s most popular songs such as a Celina, which kick-started his career. The crowd chimed in as a band made up of Kamaru’s former protégés took them through his musical journey. The funeral paid tribute to Kamaru’s two faces; the Christian and the traditional. The members of Kiama kia Ma, a council of Kikuyu elders, prayed for his departed soul while facing Mount Kenya in the customary fashion. The group, clad in traditional attire, also performed a song that Kamaru composed for the council. 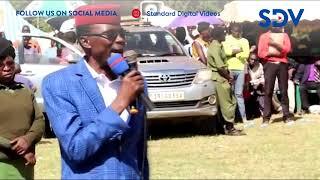 Bishop Harrison Ng’ang’a of Christian Foundation Fellowship, who presided over the ceremony, peppered his sermon with anecdotes on sexual purity and alcohol; themes Kamaru sang about until he got saved in 1997, eliciting peals of laughter from the mourners. President Uhuru and DP Ruto jokingly said the sermon made them question their salvation. 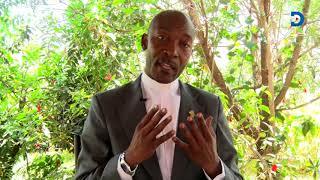 Father Dominic Wamugunda, one of Kamaru’s friends, said his music cut across genres such that “there’s no contradiction between Kamaru being saved and the messages he sang in his secular music”. The toast of the ceremony ‘was Kamaru’s sister Catherine Muthoni, known as Celina to Kamaru’s fans, who when introduced and asked to greet the President, hugged him and clung to him, prompting security officers to ask her to take her seat. She did so, but not before she kissed Uhuru’s forehead and cheerfully greeted him in the high-five fashion. 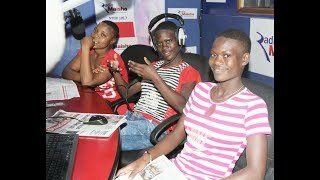 In the background, an ad hoc band made up of various artistes belted out some songs Kamau and Celina had sang, including the unforgettable Ndari ya Mwarimu (teacher’s lover). Captain Peter Kung’u Muigai, Kamaru’s friend, said he was among those who encouraged the musician not to abandon secular songs since their messages were relevant to Christians too. Susan Wanjiru, Kamaru’s widow, in a tribute read by Margaret Gachoka, said she had lost a companion. Kamaru’s son Macharia described him as a “Jew among Jews and a Gentile to the Gentiles”. “He could perform at Carnivore on Saturday night but still be in church on Sunday morning preaching because he knew how to reach both the believers and non-believers,” he said. Stephen Maina, another son, said Kamaru always wanted to improve the welfare of those in the music industry. President Uhuru said Kamaru taught the country the importance of tradition and unity. “I have known him since I was a little boy. We are mourning Kamaru but also celebrating his life. The many artistes that he mentored will carry the message forward,” he said. Ruto said Kamaru’s dedication to music and his interest in growing other musicians should be emulated by leaders. “Going forward we must bring other leaders up so that we can have a Kenya that we are proud of,” Ruto said. Raila said he met Kamaru when he (Raila) owned a studio along Luthuli Avenue and he and Kamaru would meet at a joint called “a hole in the wall”. 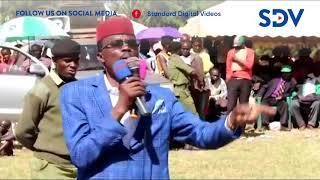 Murang’a Governor Mwangi wa Iria said there was a need to come up with a structured way to preserve art so that artistes such as Kamaru could be immortalised.